Agatha Christie The Queen of Crimes. This Webpage is dedicated to all Agatha Christie`s Fans. In 1947 Queen Mary, mother of the reigning British monarch George VI, celebrated her eighteenth birthday.BBC wanted to celebrate this event on the radio, and came to know that Her Majesty would like nothing better than a play by Agatha Christie.Hence BBC arranged for a half an hour radio play to be broadcasted in celebration of Her Majesty Queen Mary`s birthday. Within a week Chrisite`s play called "Three Blind Mice" was ready for the broadcast. Queen Mary with members of her royal family and friends listened to it in the sitting room of Marlborough House and were delighted by it.This radio play then turn back into a play not for radio but to be staged on the Theatre and was retitled as "The Mousetrap"
The famous drama "MouseTrap" was first staged in London on 28th Nov 1958.The drama is staged till today everyday without any interception. It will be celebrating its 50th years on 22nd November 2002.The famous stage artists and producers of different countries have firmly stated that this drama will continue to run every day and will run forever.If this statement is true how will the drama attract patrons?every day each show is running houseful from where the audience come? The audience for the drama are not only the residents of London , many of them are the international travellers who visit London.The floating population of international travellers to London is increasing year after year so also the patrons attending this Mouse Trap. Is it not a matter of great astonishment now that even after a half- century in London The Mousetrap can still be staged before the audiences with no ideas of its development or climax. 2)The Mousetrap was first staged at the Theatre Royal,Nottingham on 6th Oct 1952. (Directed by:Peter Cotes)The team of artists then toured to stage this play at Oxford, Manchestar,Liverpool, Newcastle, Leeds and Birminham. 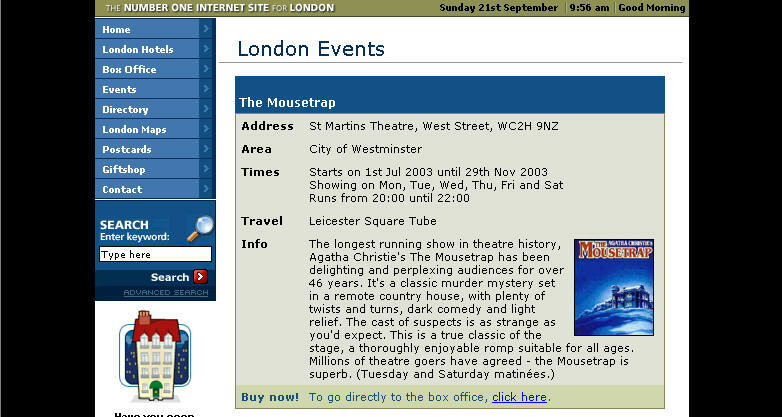 Mousetrap presented by Peter Saunders. 3)Opened in London at the Ambassador Theatre on 25th Nov 1952. Considering the reception the play received Mr.peter Saunders hoped to run the play for 12 to 14 months.Christie was of opinion that the play might run for eight months. b)Those who have seen the play in London have behaved impeccably all these years in not spreading news abroad to spoil the enjoyment of those who are yet to see the play. c)Play is an ingenious, entertaing and well constructed mystery. d)Mr.Peter Saunders very carefully nursed the production. e)Each year on the anniversary of the opening ,production restaged by a new director with the change in the cast.The success of The Mouse Trap is to put it mildly there is a bit of something in it for almost everbody, people of different age groups and tastes can enjoy seeing it.